The tactics of the work is based on determining the definition of price patterns, confirming a long trend movement. Thanks to a unique algorithm, a trading expert controls the “market pulse” and, in determining patterns of attenuation or trend reversal, stops trading until the next protracted wave movement appears. Each position of the adviser has a stop loss and take profit. The martingale method is NOT used. The grid is NOT used. 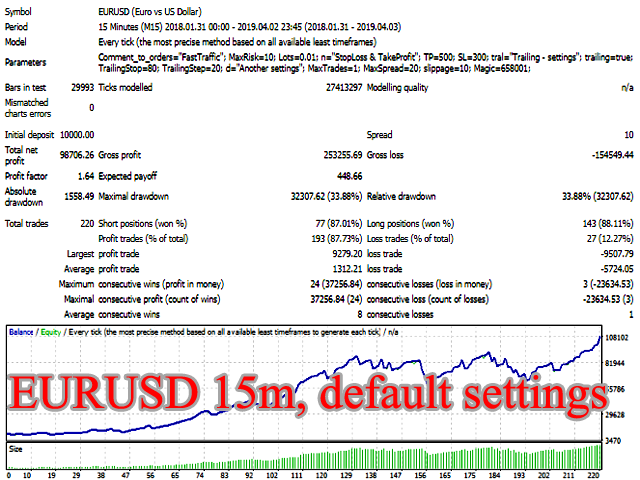 The default settings are recommended for use on EURUSD (15m) and GBPUSD (5m). Magic - Magic number to distinguish your orders from orders of foreign advisors.